" Jean Craighead George's words and Wendell Minor's paintings and narration give an evocative portrait of the impact of the buffalo on its prairie home. The audio begins with peaceful sounds-birds chirping and soft music punctuated by occasional grunts and snorts of buffalo. Then the music turns dramatic, and the sound effects mark the rifles of buffalo hunters, the chugging of steam tractors destroying the grasses, and the disastrous chomping of grasshoppers. Wendell Minor's voice is deep and authoritative. His pictures mirror his storytelling. Sweeping prairies dotted with buffalo give way to panicking men who try to beat off grasshoppers and then dark skies filled with dust. Finally, blue skies and grasslands with buffalo aplenty accompany Minor's last powerful words: "The buffalo are back." 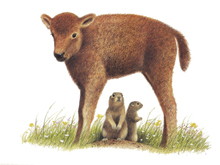 Starred Review-"With the call of the meadowlark and the bawling of a newborn bison calf opening Jean Craighead George's book the symbiotic relationship of the buffalo, the American Indian, and the grass are chronicled. The almost complete demise of the American Bison and the tall grass prairie in the mid 1800s is described, as well as their comeback through the efforts of enviromentalists such as Teddy Roosevelt. The story successfully combines fiction and non-fiction elements to present the history and future of the land and its occupants. Wendell Minor, whose beautiful watercolor illustrations enhance the text, also simply narrates the story in a tone that reflects the prairie. Of special note is the music of Chris Kubie that evokes the atmosphere of the setting through the use of the flute and other instruments. Other sound effects, particularly the meadowlark song, transport listeners to a gentler time and place. Page-turn signals are optional, and well placed pauses give listeners/readers time to peruse the book." "In 50 short years, the buffalo population went from 75 million to almost zero, and in another few succeeding decades, fertile plains grasslands turned to choking dust. Minor's impressive landscape illustrations perfectly complement renowned nature-writer George's admirably accessible account of these complicated and intertwined events. And as he did in George's The Wolves are Back (also available from Live Oak as a read-along), Minor showcases another skill-audiobook narration. His deeply measured tones are well matched to the nonfiction text, a brief history of the buffalo on the American plains. The recording is enlivened by soft musical accompaniment and background sounds (birds, train, whistles, rifle shots, ect.) that match the narrative and Minor's beautiful paintings. Page-turn signals (fluttering book pages) are optional in this examination of the buffalo's story for youngsters. A wonderful choice for both school and public library collections."